Our dress shirts for men are selling out quickly. Grab them before they're gone! 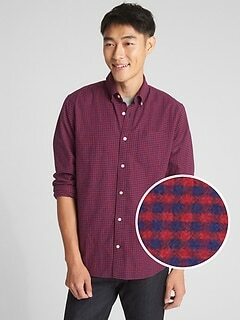 Shop the latest dress shirts for men from Gap. It's all about the look and that means investing in clothes that make you feel great. 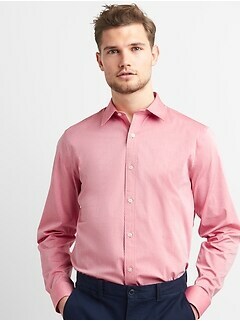 Business casual shirts for men are all about versatility. That means tops you can wear during the work week that look equally stylish on the weekend. Look for shirts with a streamlined fit. This doesn't mean it's skin tight. It means it gently skims the body for a polished look that works even if you're out for a night on the town. This selection of tops is all about the new neutrals like olive, burgundy and micro prints. These options give your wardrobe a fresh spin but keep you in your style comfort zone. If you want to seriously revamp your wardrobe, look to updating your basics first. That means classic tops with a modern fit in fresh colors and prints that make your closet feel new again. 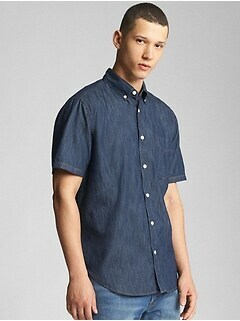 Look for shirts in a traditional button-up style with a fitted silhouette. Many of the selections here have a clean hem allowing you to wear them un-tucked while maintaining a fashion-forward look. Don't be afraid of prints. Start with micro prints like our fine-checkered shirts or small plaid patterns, which brings some bold elements to your wardrobe without going overboard. These prints are still plenty appropriate for the office and look great on the weekends too. Men's shirts for work are fantastic when they work double-duty for your downtime wardrobe as well. Sure, you aren't always in a button-up shirt, but there are occasions when you want a stylish option that feels cool and comfortable. For work, stick to a tucked-in shirt with twill pants and a belt. On the weekend, take the same garment and wear it with dark rinse denim and boots. Feeling extra snazzy? Upgrade your shoes to Chelsea boots for a look that channels casual cool for a bar or traveling in style. Throw on a blazer or sportscoat if it's a cool night. Don't discount your sneakers with the same look, but bring it down a notch with a bomber jacket or leather number.